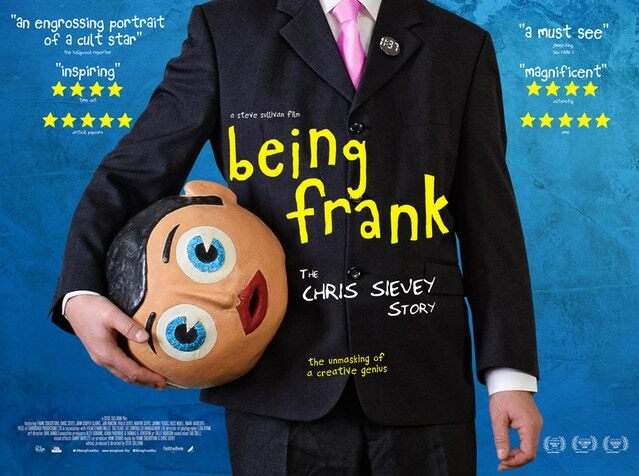 May's film from British director Steve Sullivan is Being Frank: The Chris Sievey Story (2018). Driven by a devoted and loyal fanbase, this tender and absorbing posthumous (Sievey died in 2010) documentary was funded by a grassroots KickStarter campaign and spearheaded by award winning film maker Steve Sullivan (Heap of Trouble 2001). 7 years in the making, the film was a labour of love for Sullivan. He was given unparalleled access to an archive of material found rotting in the late Sievey’s brother’s cellar, from which he has managed to fashion order from the the chaos of found VHS tapes, cardboard cutouts, notebooks, costumes, memorabilia and inspired zine artwork. Peppered with affectionate and penetrating interviews from friends and family, it provides a frank insight into the invisible creator and his larger than life highly visible creation. It dares to take a peek at the man behind the mask, albeit a papier mâché one, and attempts to pin down the allusive creator, his motivations and his creative process. But ultimately ‘it’s a celebration of a uniquely hilarious and brilliant person, an artist driven by creativity and playfulness’ (Dan Stubbs - NME) and even frustration, and his need for some sort of recognition and an audience, even if that fame belonged to his creation and was at the expense of the creators’s own and very different ambitions. We at WFC headquarters can’t wait to screen this wonderful, thoughtful and thought provoking film.